Primitive Cool is an RP51 purchased by John Newbold in 2013. As Secret Men’s Business it won the 2010 Hobart and placed third in the high performance Division Z of the 2013 Rolex Fastnet Race (UK). Primitive Cool has been successful in major events, including those run by the ORCV. It currently holds the Melbourne King Island Race record. 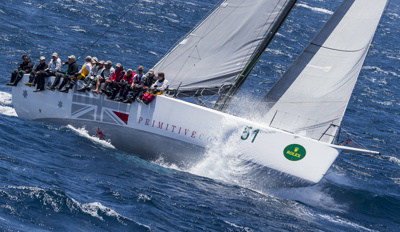 In last year’s Hobart, it revelled in some tough conditions to finish fourth overall and second in Division 1, bearing testimony to the yacht and its preparation by boat manager David Sudano. Newbold and his crew will again represent Sea Shepherd - whose mission is to end the destruction of habitat and slaughter of wildlife in the world’s oceans - a cause they hold in in high esteem.